If you find the movement of this thing slightly unsettling, you’re not alone. When I was a kid, I had not only a shelf of Breyers, various knock-offs and stuffed horses, plus the real piece de resistance — the moving Barbie horse. You could jam a couple of AA batteries and turn the dewy-eyed palomino on, then set it on the floor and watch it rattle its way across the kitchen. When one strapped Barbie into the saddle with her toes a-pointing, she would flop about for a few strides before generally getting hung up and dragged by a leg. It was a good time. 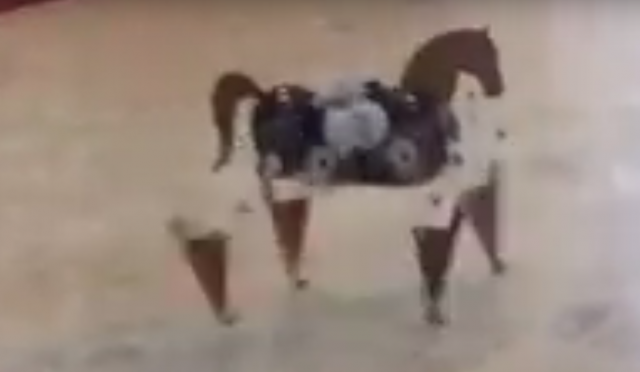 This mechanical horse is… slightly less adorable. Actually, it’s a bit creepy. Something about those herky-jerky inflexible legs just makes me feel… uncomfortable. How about you?